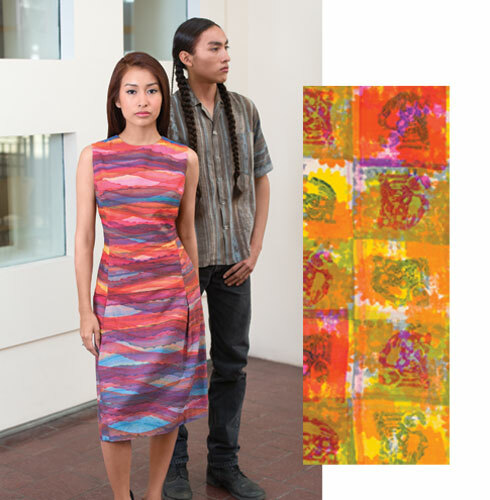 Above: Lloyd Kiva New designed this Southwest-patterned ensemble; it dates to the early 1980s. 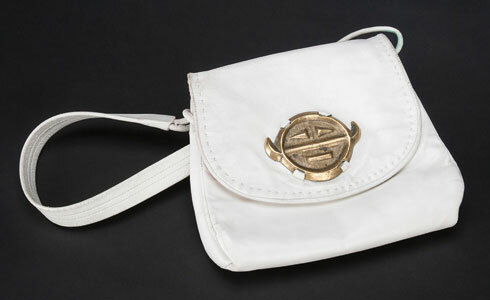 White leather Kiva bag with Charles Loloma detailing, from the 1950s. Born in Oklahoma to Cherokee and Scottish-Irish parents, New became the first Native American graduate of the vaunted Art Institute of Chicago. 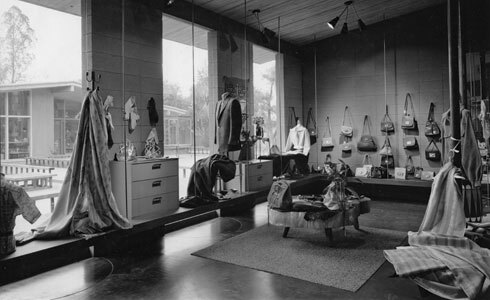 In the 1940s he helped turn Scottsdale, Arizona, into a major Southwest arts hub by opening a fashion boutique that celebrities and style makers flocked to in search of New’s signature Native-print apparel and beaded leather handbags. 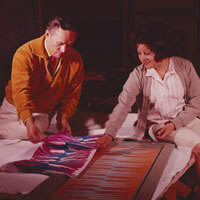 In the second act of his life, as IAIA’s first art director and eventual school president, New helped transform the institution from a relatively modest arts-focused high school into the world’s foremost center of contemporary Native American art studies, and a fully accredited four-year college of higher learning. Appropriately, the first of Santa Fe’s three 2016 exhibits opened recently at IAIA’s museum. According to Flahive, MOCNA’s archivist, the impetus for the show began when he met New’s widow, Aysen, a few years ago. He asked her if she had any items of Lloyd’s left, as these items would be welcome additions to the museum’s archives. “I ended up cleaning out his office and garage and bringing back the largest historical collection—around 400 items— we’ve ever assembled,” Flahive exults. The Southwestern landscape is reflected in this 1950s hand-dyed wool-jersey sheath. This particular New-designed button-front shirt was worn by the artist while he painted. Detail of fabric printed with glyph-inspired designs, c. 1960. Courtesy of the IAIA Museum of Contemporary Native Arts. Tony Chavarria, curator of ethnology, says, “The focus is squarely on the extensive and surprisingly varied scope of New’s artwork. It showcases both his paintings—mostly works in gouache and watercolor, but some oils and pastels— and many of his legendary fashion pieces.” Supplementing his artwork in this retrospective show are photos from throughout New’s life, including images from his childhood and his years rising to prominence as a designer in Scottsdale. at the Institute of American Indian Arts. Recognizing that the museum’s permanent collection contains a considerable trove of holdings by artists who either studied or taught at IAIA—including Fritz Scholder, Melanie Yazzie, and Neil Parsons—curator Carmen Vendelin developed an exhibit that aims to consider the increasingly avant-garde and self-deterministic approach to Native art espoused by New and the IAIA in the broader context of contemporary art. “The development of IAIA in the 1960s occurred exactly as we were moving from modernism to postmodernism,” says Vendelin. As artists began increasingly to weave personal and political beliefs about feminism, economic inequality, and human rights into their work, so too the creative forces at IAIA began to challenge the traditional definitions of Native American art and identity. A highlight of this exhibit is a group portrait of IAIA faculty by the iconoclastic Native American artist Fritz Scholder, a friend of New and teacher at the institute. “He and some of the others we’ve included in this exhibit were specifically critical of the way Native Americans had been depicted historically by non-Native artists,” she says. Details of New-inspired textiles from IAIA/MoCNA’s Honors collection. Dyes on cotton; unknown artist, date. Details of New-inspired textiles from IAIA/MoCNA’s Honors collection. The medallion-patterned fabric was designed by Nathan Jackson (Tlingit), dyes on silk, c. 1963. NMMA and MIAC are collaborating on an art publication about New, which is due out in May. The curators are also producing a gallery brochure featuring the exhibits at all three institutions, and will be presenting joint lectures, panel discussions, and fashion-related events. Additionally, Ryan Flahive—who relied heavily on New’s papers to produce a 2012 history of IAIA, Celebrating Difference: Fifty Years of Contemporary Native Arts at IAIA—is publishing the artist’s memoirs, titled The Sound of Drums, this month.